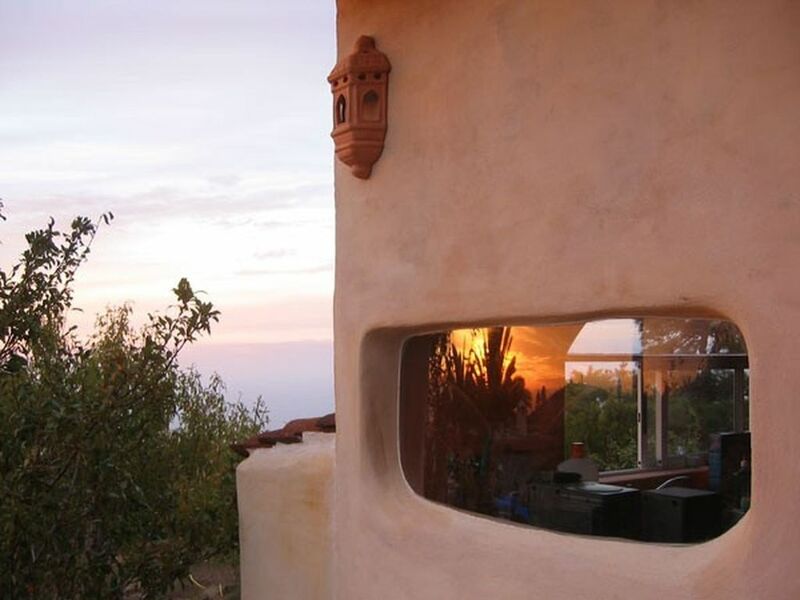 The Casa is located in the fertile north-west of La Palma in the district Garafia / Las Tricias on approximately 480 m height, with beautiful sea view, in the evening at the setting sun and at night in the starry sky. At Casa Buena Vista is one beautiful organic garden with many vegetables and fruits in the midst of a year-round lush landscape. The pool is a few steps from the Casa away and invites you to swim and relax. On the terraces are sun loungers and shade umbrellas. The guest house offers enough space for 1-3 people. It consists of a living room with sofa bed, a kitchenette with a stove, oven and fridge, and bath and shower baths. Another, separate bedroom with large double bed with a continuous latex mattress has its own shower and toilet. Throughout the house there is a floor heating. The terrace is partly covered, so that you find enough sun and shade areas. In the kitchen you will find plenty of crockery and cutlery, coffee maker, espresso maker and a lot of useful kitchen utensils. Internet (wired and wireless), CD player and TV with many domestic and foreign channels are available. We are happy to bake on request delicious wholemeal bread and prepare every morning tasteful, biological smoothies. Upon request, we also offer deeply relaxing massage and yoga. In the immediate vicinity are beautiful hiking trails, z. B. the Camino Real, which guides you through old villages, vineyards, almond groves and through deep ravines. You can reach the sea in the bay Lomada Grande in about 1 ½ hours over a hidden trail. The sandy beach of Tazacorte can be reached in about 35 by car. You can shop in Punta Gorda, about 5 kilometers away. Here you will find supermarkets, pharmacy, gas station, health food store, cafe, pizzeria, bars and restaurants. Two very good restaurants, the AZUL and Tasca El Castillo, situated about 3 kilometers away and can be reached on foot. For sports enthusiasts to paragliding, mountain biking, diving, canoeing and horseback riding offer. We spent 10 nights in the finca with our 2 girls (8 and 10). We loved the seaview, the beautifull gardens and the lovely finca in Canarien style with swimmingpool. The owners are very kind and helpfull. Thank's for everything Karin! Wir hatten einen tollen Urlaub in dieser außergewöhnlichen Finca. Guter Ausgangspunkt für viele schöne Wanderungen, einen Pool mit Meerblick, verschiedene Früchte vor der Nase, täglich netten Katzen und Hundebesuch. Bett sehr bequem, 2x Bad( sehr komfortabel) und in der Küche alles, was man braucht. Abbiamo soggiornato qui dal 24 ad oggi 31 agosto. La casa Buenavista si trova all'estremo nord ovest di La Palma, una zona verdissima, ricca di boschi di pini e affacciata sull'oceano. Un vero paradiso! Arrivarci richiede pazienza perché le strade dell'isola sono piene di curve, ma una volta arrivati ciò che si trova è ancora meglio delle foto del sito. La casa si trova appena fuori del piccolissimo centro abitato di Las Tricias, un posto molto tranquillo e carino, con un belvedere da cui si gode di una bellissima vista dall'altro sul mare. La casa è fuori dal centro abitato in un posto paradisiaco, a circa 500 mt di altezza, immersa nel verde e nella pace. E' comunque molto semplice raggiungere un supermercato per fare provviste. La casa è deliziosa, molto curata, con una bellissima luce sia al mattino che al tramonto. E' molto bene arredata, con tutto quello che può servire e anche di più. Ha diversi punti luce all'interno, che creano un'atmosfera molto accogliente e rilassante. Dei bei colori alle pareti e piena di piccoli dettagli originali. Ha delle finestre particolari con angoli stondati e dappertutto una vista sul verde. Si sta benissimo! Karin e Joachim sono molto gentili e disponibili ed è molto piacevole chiacchierare con loro delle bellezze dell'isola. La finca ha anche una piscina, un vero paradiso dopo le lunghe passeggiate nella Caldera del Taburiente. La piscina si affaccia sulle nuvole e sull'oceano e da lì si può "contemplare" un tramonto stupendo. La cucina della casa è molto bene attrezzata, hai una zona in giardino in cui fare colazione comodamente e un'altra zona con una diversa esposizione, con due belle sedie a sdraio su cui rilassarsi. Anche i bagni sono comodi e le docce funzionano bene. Ogni tanto Luna, il cane del padroni di casa, ti viene a fare una visita, per poi continuare per la sua strada. Gattini girano per il giardino, sul cielo può capitarti di vedere volare qualche piccolo falco, la notte senza luna brilla di tutte le stelle. Insomma è un posto meraviglioso per chi cerca pace e tranquillità, ma anche ha voglia di camminare su sentieri sempre diversi.Consigliatissima!! Bedankt voor de waardering! Leuk dat je daar was en dat je geweldige gasten was !!! Traumhaft schön! ¡Maravilloso! ¡Un paraíso! Estuvimos casi tres semanas en esta maravillosa isla y tuvimos la suerte de poder disfrutarla de nuevo viviendo en la preciosa finca de Karin y Joachim. Les estamos muy agradecidas por su amabilidad y su generosidad al compartir con nosotras su pequeño paraíso en uno de los lugares más hermosos de La Palma. La casa es preciosa y está muy bien equipada, por todas partes se descubren pequeños detalles que hacen ver que fue decorada con mucho cariño. El dormitorio es fresco para dormir, el jardín es sorprendentemente frondoso y rico en frutales, como los mangos, manzanos, la morera o los aguacates con los que Karin nos obsequió algunas mañanas. Disfrutamos también de la compañía de los gatitos y de Luna, la perra, que viven en la finca. Todo hizo que fuese para nosotras una muy buena experiencia que ya estamos deseando repetir. Sin duda, más que recomendable. Fast drei Wochen haben wir auf dieser wunderschönen und beeindruckenden Insel verbracht. Dieses Mal hatten wir das Glück sie von Karins und Joachims Finca aus erneut zu genießen und auch so viele neue Ecken zu entdecken. Wir sind Karin und Joachim sehr dankbar für die Herzlichkeit und Großzügigkeit mir der sie uns entgegengekommen sind, uns viele Tipps gegeben haben und mit uns ihr kleinen Fleckchen Paradis an einem der schönsten Gegenden der Insel geteilt haben. Eine sehr entspannte Atmosphäre, die uns in jedem Moment unseren Freiraum gelassen hat, wir aber zu jeder Zeit mit Fragen auf sie zukommen konnten. Das Haus ist wunderschön, hat alles was man sich für einen entspannten Urlaub wünschen kann und toll sind auch die vielen kleinen Details, die wir Stück für Stück entdeckt haben, die zeigen mit wie viel Liebe das Häuschen eingerichtet und dekoriert wurde. Das Schlafzimmer ist auch im Juli angenehm frisch zum Schlafen. Nicht zu vergessen der paradiesischen Garten in den das Häuschen schön eingebettet ist, mit seinen vielen Obstbäumen, Mango, Apfel, Maulbeeren, sowie Avocados mit denen uns Karin manchmal morgens überrascht hat. Wir vermissen jetzt schon die Katzen und Luna, die Hündin, die auch auf der Finca wohnen. Alles in Allem eine fantastische Erfahrung. Der Wunsch bald wieder zu kommen ist groß. Ohne jeden Zweifel ein tolles Urlaubsziel. Vielen Dank für die wundervolle Bewertung! Wir fühlen uns sehr geehrt! We zijn 14 dagen in casa Buena Vista geweest, en we hebben een super fijn verblijf gehad. Alles wat al over het huisje geschreven is, klopt. De ligging van het huisje maakt dat het bijzonder geschikt is voor mensen die rust zoeken en graag van de natuur willen genieten. De eigenaren hebben ons veel tips gegeven voor uitstapjes op het eiland. De supermarkten zijn zeer goed bevoorraad dus neem niet teveel mee. Een huurauto is een echte must. De beide badkamers zijn middels een gordijn gescheiden van de andere ruimtes, wel even goed om te weten. Huisje heeft veel privacy en een waanzinnig mooi uitzicht. Hello and welcome to La Palma! Here is a short description of how to get to your holiday destination "Casa Buenavista". The total travel time from the airport is about 1.5 - 2 hours. From the airport, head towards Santa Cruz and then follow the signs to Los Llanos, up into the mountains and through the tunnel. Following the main road you pass the information center "Caldera de Taburiente". ATTENTION: Stick to the prescribed speed, because here is a speed camera! The next town is El Paso. Here you can shop well in a large supermarket. It is located directly at the first traffic light (turn right and then immediately left to the supermarket parking lot). Follow the signs to Tazacorte / Tijarafe. You now follow the bypass of Los Llanos via 2 more roundabouts to Tazacorte / Tijarafe. After the third roundabout, after about 300 meters turn off in the direction of Tijarafe / Puntagorda. Now it goes through the largest gorge of the island, the "Barranco de los Angustias". Once you pass this Barranco, you will arrive at the "Mirador del Time" on the other side. In the local restaurant, you can enjoy a fantastic view over the west side of the island and the southern volcanic chain at a "Cafe con Leche" (a milk coffee). Now you drive on the west side of the island, winding but at approximately the same height, through Tijarafe continue towards Puntagorda. You drive past the large gas station through another gorge. You drive uphill again and reach a street fork. On the left is a bus shelter, on the right is the Roque des Los Muchachos and Barlovento. BUT LEFT HERE THE LP114 and to Las Tricias. On the left is a church, on the right a small bar. Drive between the two, the winding road continues downhill. Then suddenly there is a house on the street! Further downhill you will see the kilometer sign 3 on the right. Approximately 50 meters further on, there is a bus stop on the left and immediately afterwards a small asphalt road goes downhill. Follow this small street and after about 200 meters you will drive to Casa Buenavista. You have reached your destination. Der Mietpreis bezieht sich auf 2 Erwachsene und maximal 2 Kinder unter 14 Jahren. Für eine dritte oder vierte Person über 14 Jahren wird eine Zusatzgebühr von je 8 Euro erhoben.